Average adult size (length): 54"-78"
Head: Long and broad, wider than its neck. Consist of dark colors that range from a charcoal gray to black. Has a red stripe running from its internasal to the neck. Body: massive girth, tail is short and tapers sharply at the end of the body. Posterior colors are mostly dark hues with pale pattern or blotches; Anterior colors are light hues with dark patterns. Light colors consist of pale yellow to orange and the dark colors range from dark orange to various shades of red and even black. A blood python living in its natural habitat will spend most of its time underwater. While submerged in a river or stream, the blood python waits for its meal to cross its path. Python curtus would then stalk the targeted prey and ambush it. This aggressive characteristic is evident in other behaviors of the blood python. For example, people who catch blood pythons in the wild have reported many violent, ill-tempered actions. Wild pythons living near human settlements are more likely to be regarded as dangerous pests than as exotic pets. On the other hand, blood pythons that are raised and bred tend to be more docile. The people who catch the species Python curtus are mainly breeders and collecters of exotic animals. Blood pythons have become endangered due to the fact that their beautiful skin is now in high demand on the exotic leather market. 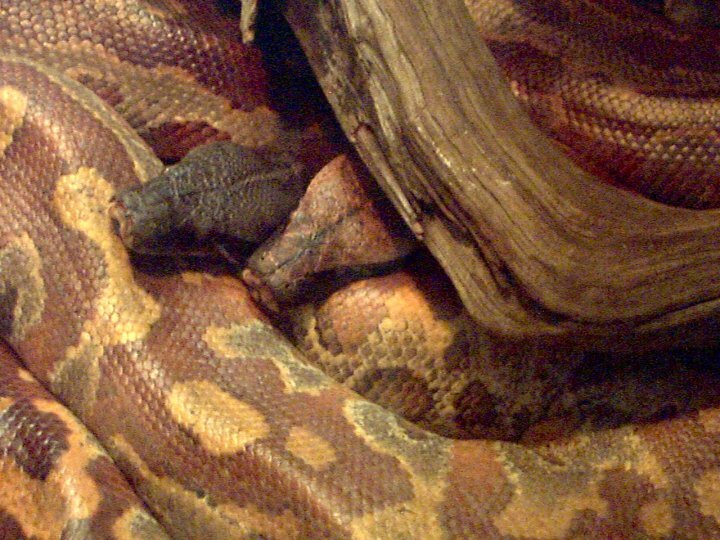 Blood pythons also have special features that differentiate them from other snakes. These features include: lower jaw suspension for large prey; upper and lower jaws with palatine bones containing curved teeth for instant hold on prey; internal pair of hind legs in the shape of stout spurs that can leave a scratch in defense; these spurs are also used by the male to hang onto a female during mating. Evidence of pits in the roof of the mouth suggest that pythons once were venomous snakes. Pythons have heat-sensing pits on the upper lip that help them to detect their warm-blooded prey. Blood pythons have only two large pits on each side. You can easily see these pits in the large picture at the top of this page. With the ability to constrict their muscles, blood pythons can protect and defend themselves and their young. When brooding females lay eggs, they will coil up into a tight ball over the nest generating heat needed for incubation. Because of the energy used in shivering, a female may lose half her body weight during the incubation period. Also, the constricting feature aids the blood python in killing its prey by suffocation. 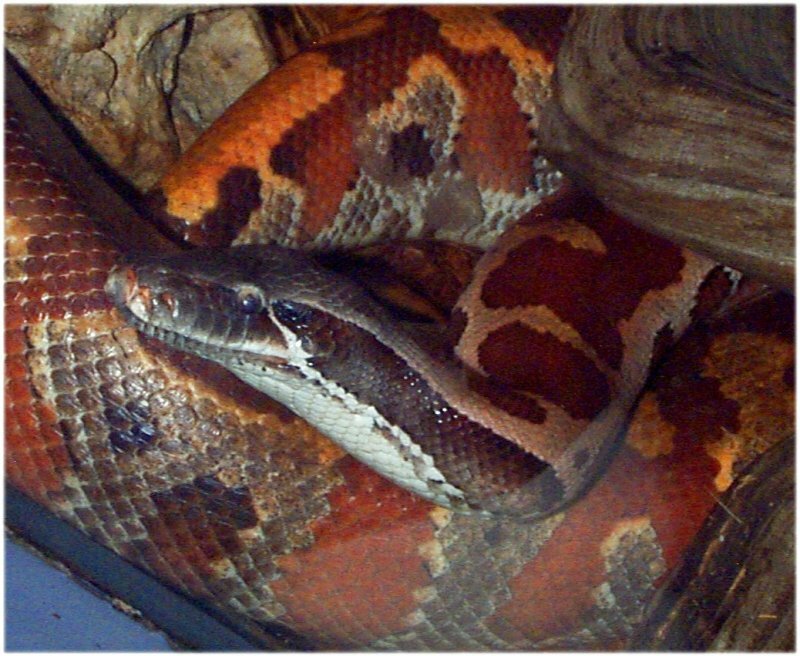 Five years ago I owned a red-tailed boa (located in the same family as pythons) named Fritz. Fritz was constantly in action. Whether he was attempting to escape his cage or was playfully slithering in, out, and between my fingers, Fritz was very energetic. In opposition to Fritz and his personality lies the two full grown blood pythons at the Fort Worth Zoo. In my two trips the the Herpetarium, I observed the snakes. Both encounters consisted of no action. 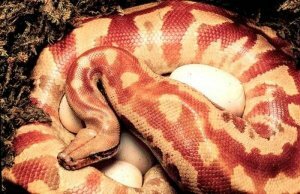 Each blood python was comfortably curled up into a ball in the corners of their cage. Even respiratory movements were non-existent and it was hard to tell they were even alive! My guess is that I had arrived directly after lunch and the blood pythons were trying to digest their meals. The cage in which the two blood pythons stayed simulated their natural environment. A long branch stretched across the two levels with many shrubs and leafy plants scattered about. Also, a small pond was located toward the back of the cage where rats are released for lunch. Parker, H.W. Snakes: A Natural History. 2nd ed. London: Cornell University, Press. 1977. 121-123. Pope, CliffordH. The Reptile World. New York: Alfred A. Knopf, INC. 1995. 173. Schmidt, Karl P. and Robet F. Inger. Living Reptiles of the World. Garden City: Doubleday and Company, INC. 1962. 181. Other pythons at the Fort Worth Zoo include the Burmese Python, Black-headed Python and Green Tree Python.